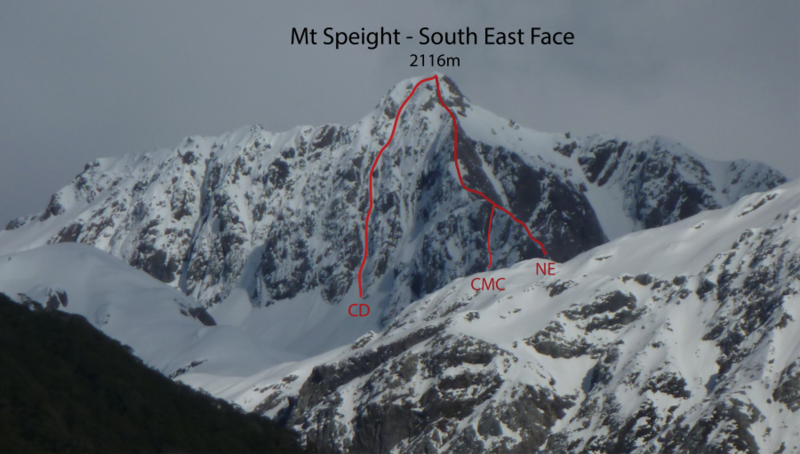 Mt Speight was first climbed by Roger Chester, R E McInnes and H C Wickett in April 1930. Mt Speight Buttress has some of the best quality rock in the Arthurs Pass National Park. From the Waimakariri River access via Harper Creek. Follow Harper creek until reaching and impassable waterfall. Turn left up steep snow (or scree) gulley, be mindful of avalanche and rockfall. Trending left towards the top of the gulley. 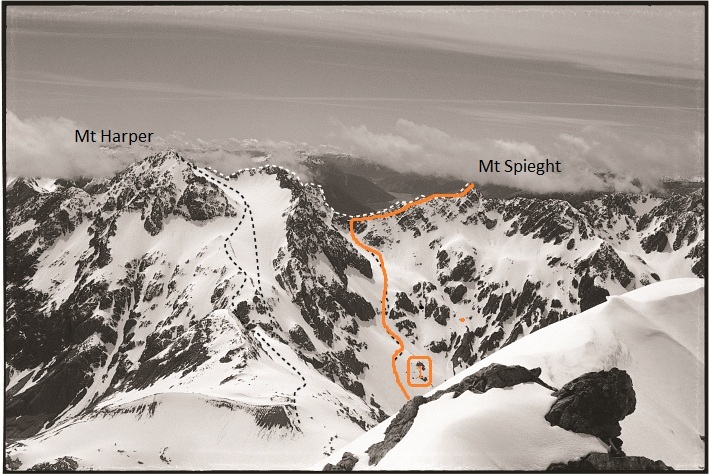 Upon reaching the ridge, drop onto the southern side and sidle towards Mt Speight. Allow 6-8 hours from Klondyke Corner. A 150m long couloir that leads up to the North East Ridge. The first (crux) pitch had some mixed (M4) moves, with good rock protection in solid orange greywacke. Two more ice pitches in the narrow couloir lead up to the North East Ridge. Follow the ridge to the summit. This route has had several ascents over the past decade; though its first ascentionists have not been recorded. Climb to the head of Harper Creek and head towards the basin below the northeast side of the peak. Ascend a rock slab on far left, which leads to the main North East Ridge. From here the ridge steepens to a short 10–15m pitch (crux). Above is a nice red arete, which is followed until broader, easier ground, to loose rock for the final 50–80m to the summit. Descend the North Ridge. Usually climbed from the old Greenlaw Hut site, by ascending the spur between Greenlaw and Harper Creeks to the snowfield below the peak. The col at the head of the snowfield, north of the peak, gives good access to the North Ridge. Gain the large snowfield east of the saddle between Mt Speight and Mt Harper, by climbing out of Harper Creek and then up and across the spur bordering Greenlaw Creek. Climb the ridge from the saddle. From the head-waters of Burnet Stream. Ascend the scree/snow-slope north of the creek that drains Speight’s West Face. A steep pitch joins the permanent snow-slope (beware of bergschrunds) that leads to the prominent col north of Mt Speight. Follow the ridge to the summit. From the head of Burnett Stream climb scree and rock to a small glacier that leads to the North Ridge of Mt Speight. Scramble along loose rock to the summit. The lookers left gully of the two central gullies. Tops out directly to the summit. Four pitches (WI2-3) and ~150 meters of moderate snow. Minimal rock protection on lower pitches, with some pro found on the left shoulder of the upper snow slopes.